Learn how to make this adorable 6" x 7" hanging pocket for light-weight sewing notions or snippets with a 4" x 5" removable turtle pin cushion! 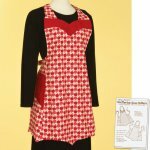 Learn how to make this cute and sassy apron with scalloped edges and a fun front. 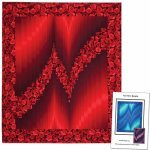 Create a beautiful bargello quilt with just an ombre (color gradation) fabric and a contrasting fabric. This 2 fabric bargello quilt uses a little less than traditional tube construction methods. Learn the necessary skills for creating a beautiful quilt top that you can be proud of. 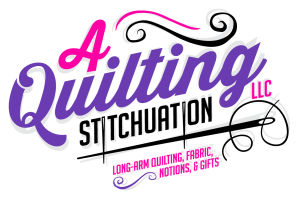 Learn how to pick fabrics, color choices, equipment/tool choices, how to cut fabrics, sew blocks together and then how to create the top. Learn to make a BIG Teddy Bear! 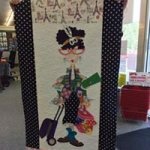 In this class you will be making a collage quilt by fusing many different fabrics over a base or underlay fabric. You may choose ANY of the Collage patterns from Laura Heine for this class and I have several in stock, including: "Old Blue", "The Dress", "Pincushion", and "Purrfect...". Do you want to do the project in all Kaffe, all floral, fun prints, small prints, large and small scale prints, or a mixture??? Your options are endless! Want that quilt to be a show winner? Learn to bind like a professional. Create French double fold, flange binding, piped binding, bias binding for scalloped edges, and much more. Learn to insert prairie points, lace or even ruffles to give your quilt a different look. Regardless of what kind of machine you own, Floriani Embroidery Basics is the perfect event for you to take your embroidery to the next level! This amazing educational lecture/demonstration is filled with industry secrets that will inspire your creativity. With lessons covering everything from selecting embroidery materials for your projects to the tricks that will perfect your craft! Never again will you have to worry over ruined garments, puckered embroideries and off-center designs! NSPIRE YOUR CREATIVITY WITH THESE INDUSTRY SECRETS! ? Secrets to proper stabilization and thread choices. ? How to choose designs based on how they will affect your garments. ? Stress-free techniques for hooping and eliminating puckering. ? How to choose the right needle for stitch and garment type. ? How to have fun in your sewing room with perfect results! PRE-REGISTERED Attendees will receive a FREE GIFT Valued at $499! Learn how to make this easy Flying Geese Quilt! Sharpen your skills with advanced free motion quilting on your domestic machine. Learn new things to fill squares, make orange peel, clamshells, puzzle pieces and even using double needle. Add to your "book of stitches." Complete a thread painted bird and learn other ways to use thread painting. Learn the basics of free motion quilting on your domestic machine. Learn stippling and beyond, fillers for borders and blocks, create a book of stitches and a way to make your quilting “pop” with a new method of doing trapunto. Take home a finished trapunto piece! Learn how to make this beautiful black and white quilt. Carry all the makings for a hearty lunch in this roomy bag. A mesh pocket on the inside holds an ice pack or utensils. An optional chalkboard border on the front and a see-through pocket on the back provide space for ID or fun notes. The fold-over flap closure opens wide for easy access to the bag's contents yet fastens securely for convenient transport. Learn how to make this fun and easy to sew bag with lots of pockets and fat quarter friendly! Learn to create a pattern from a photo using software. Use the pattern you created to design a quilt. 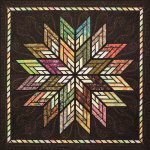 Design a quilt with color values in mind. Make the quilt using paper backed fusible web and stitching to enhance the look of the quilt. MAKE AN ORIGINAL BLOCK! What do you get when you combine quilting and Paintstiks?? You get a wonderful new quilting technique that is easy and fun. There are no painting skills required! Students will create elaborate original design stencils following a few simple guidelines. Students will work on an 18? square block during class. J. Michelle Watts will share lots of samples, ideas and inspiration for creating wonderful stenciled quilt blocks and quilts, including stenciled 2? miniature quilt blocks using her NEW Laser Cut Stencil Kits. Students are able to use her collection of Paintstiks? while in class. This is a full day class (6 hours). Learn how to make this fun rug that is the latest craze! Using a jelly roll and strip batting you create your own fun! Learn how to make this JUMBO Quilt Bag to carry to retreats, friends' houses, and more! Learn to make this pretty quilt using one layer cake! Learn how to dress up YOUR INNER Quilt Diva! An applique' class that you can have fun with and be as creative as you dare! At the end of class you will earn your "Quilt Diva" Pin!!! What to do with all the t-shirts? Make a quilt to keep the memories close to the heart. Create a t-shirt quilt with sashing or without. Learn to stablize and cut t-shirt fronts to the same size for creating a warm and memory filled quilt. Learn to make this Eazy Peazy Tabletop Pocketeer your way! 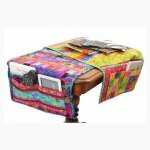 This works for a nightstand, end table or sewing table to store remotes, books, sewing supplies, etc. Sized for standard 24" length table with directions for other sizes. This is perfect for beginners and is Jelly Roll friendly! Always wanted to make your own Tuffet? Now is your chance! This 18" round Tuffet is a great addition to any room! You may even make a slipcover to change out for the holidays, special occasions or just to blend in with a different room decor (pattern included in original pattern). You will create this beauty using up your scraps, 8 fat quarters, or 1 1/2 yards of your favorite fabric! Tuffets are a beautiful accent to any home and fit with any decor. They make great gifts for special occasions including weddings, new babies, anniversaries or just because. Let your imagination run wild and create that one-of-a-kind conversation piece for your home or for someone else. You will be stylin' once you make this beautiful jacket!